To Mr. and Mrs. Watson, Mercy is not just a pig – she's a porcine wonder. And to the portly and good-natured Mercy, the Watsons are an excellent source of buttered toast, not to mention that buttery-toasty feeling she gets when she snuggles into bed with them. This is not, however, so good for the Watsons' bed. BOOM! CRACK! As the bed and its occupants slowly sink through the floor, Mercy escapes in a flash – "to alert the fire department," her owners assure themselves. But could Mercy possibly have another emergency in mind – like a sudden craving for their neighbors' sugar cookies? Welcome to the wry and endearing world of Mercy Watson – an ebullient new character for early chapter-book readers in a series that's destined to be a classic. Kate DiCamillo is the author of THE TALE OF DESPEREAUX, which received the Newbery Medal; BECAUSE OF WINN-DIXIE, which received a Newbery Honor; and THE TIGER RISING, which was named a National Book Award Finalist. She says, "Mercy Watson had been in my head for a long time, but I couldn't figure out how to tell her story. One day, my friend Alison was going on and on and on about the many virtues of toast. As I listened to her, I could see Mercy nodding in emphatic agreement. Sometimes you don't truly understand a character until you know what she loves above all else." Chris Van Dusen is the author-illustrator of DOWN TO THE SEA WITH MR. MAGEE, A CAMPING SPREE WITH MR. MAGEE, and IF I BUILT A CAR. He says, "When I first read Mercy Watson to the Rescue, the characters were very vivid in my mind, and they just came to life when I started painting. This is exactly the type of story I love to illustrate — a wonderfully silly adventure with lots of action." This is his first book with Candlewick Press. Van Dusen's boldly hued, tactically hyperbolic gouache paintings tap into the narrative's wry humor and joie de vivre. Appropriate as both a picture book and a beginning reader, this joyful story combines familiar elements with a raucous telling that lets readers in on the joke. DiCamillo employs enough creative word choices to elevate the story beyond the controlled vocabulary of a first reader, yet the short chapters, large font, double spacing, and easygoing narrative make it approachable for transitional readers. 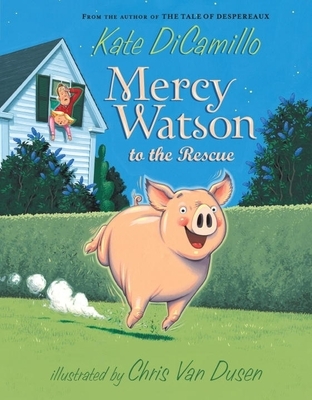 Mercy Watson, a disarmingly charming pig adopted by a loving human family, makes her debut in this new series of chapter books for beginning readers. DiCamillo's suspenseful yarn keeps readers turning the page, while the retro-folksy illustrations by Chris Van Dusen go for laughs and make for a gentle transition from picture books. All heck breaks loose in this affectionate screwball take on bringing up baby. This fast-paced tale features a pig named Mercy, a problem neighbor, and piles of buttered toast. Short and peppy chapters for reading or read-alouds. Mr. and Mrs. Watson live in a charmingly retro world with their adorable pet pig. DiCamillo's tightly woven, outlandish story shows she's a pro at making readers laugh. With its straightforward story line, repeated text and hilarious illustrations, this new series should delight young readers. An ebullient new character for early chapter-book readers in a series that’s destined to be a classic. A beguiling blend of slapstick and whimsy.